Mozart wrote only one two-piano sonata – the D major K. 448 – but the largest of several additional sketches reveals evidence of the beginnings of another sonata for the same forces. British pianist Anthony Goldstone happened upon the fragments which date from 1781 to 1783, whilst browsing the Neue Ausgabe (published by Barenreiter) in 1997. Over the next eight years he created a new three movement sonata using the fragments as the basis. It is recorded here for the very first time and has already drawn praise and commendation from several eminent musicians and musicologists including Brian Newbould, Anthony Payne, Julian Rushton, Philip Wilby, H.C. Robbins Landon and John McCabe. Also featured on the disc is the famous two-piano sonata plus Sonata K. 283 (with the second piano part by Grieg), the Adagio and Rondo K. 617 – also arranged for two pianos by Goldstone and here making a first recorded appearance. Also included on the disc is Busoni’s arrangement for two pianos of the Magic Flute Overture – quite probably the first digital recording. 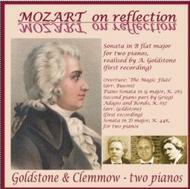 With over thirty CD’s to their name and a busy concert schedule, the British piano duo Goldstone and Clemmow is firmly established as a leading force, described by Gramophone as a “dazzling husband and wife team”, and by International Record Review as “a British institution in the best sense of the word”. Their live concerts are a refreshingly presented mix of famous masterpieces and fascinating rarities. They have made numerous BBC broadcasts and have consistently presented first hearings of unjustly neglected works.